Multi Tool Lighter – great for camping! The Multi Tool Lighter is a great accessory for anyone who likes the outdoors and has a multitude of tools to get just about any job done. The Multi Tool Lighter is especially good for when your camping and has all the devices necessary to make your stay more comfortable. The Multi Tool Lighter features a knife, screwdriver, bottle and can opener, corkscrew, scissors and of course a lighter. It comes on a keyring so you can attach it to your trousers or a bag so you don’t lose it. Small and compact enough to fit into your pocket, the Multi Tool Lighter is the perfect outdoor accessory to have. It is available now for £14.99, Bargain! The Multi Tool Lighter is a great accessory for any smoker who also likes the great outdoors. 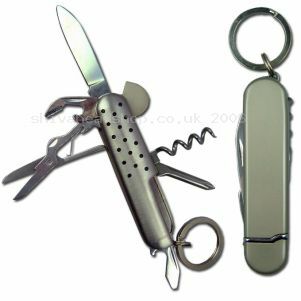 Combining a range of handy tools including a knife, screwdriver, bottle opener and corkscrew, the Multi Tool Lighter is a great accessory to have. 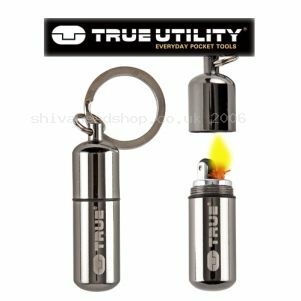 The Multi Tool Lighter is refillable and comes in a smooth, satin finish and is a strong and durable piece of kit. It also comes with a key ring attachment so you can put it on just about anything. This is definitely a must have for anyone who likes to solve problems when they are on the move. The Multi Tool Lighter is available now for just £14.99 and is one tool you cannot be without. Keyring Piecepipe – perfect for a sneaky smoke just about anywhere! • ‘hit mode’, slide up one position to reveal the pipe bowl, fill, light and enjoy. • ‘reload mode’, open to the second position to reveal a handy stash compartment where you can store your herbal blends. The middle of the pipe comes fully out for easy cleaning and to keep the pipe in tip top condition. 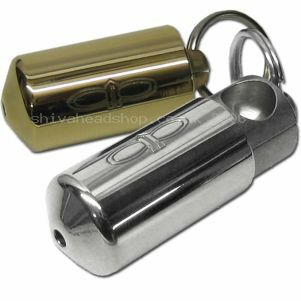 The Keyring Piecepipe is available in silver or gold and is a great present for any pipe enthusiast. Available now from Shiva, the Keyring Piecepipe is £29.99. The Multi Tool Lighter is designed for those who like the great outdoors and has all the tools you will ever need for camping, hiking or any other outdoor activities. The Multi Tool Lighter has everything you would expect from a pen knife including a corkscrew, scissors, bottle and can openers, a screwdriver and of course a knife and refillable lighter. The Multi Tool Lighter comes with a smooth, satin finish and a keyring too so you can attach it to virtually anything from your trousers to a bag, so you know where it is at all times. The Multi Tool Lighter is available now from Shiva for the bargain price of just £14.99.